When something seems too good to be true, it probably either is or won’t last long in case it is true. Starting tomorrow, March 1st, two years after the first change, Zecco will once again restructure its commission. This time, eliminate the free trades all together and raise commission for stock trades. The following is a letter I received from Zecco last Friday. Thank you for being a Zecco Trading customer. I hope you’ve been enjoying the exciting improvements we’ve rolled out in the last few months. When Zecco Trading first launched in 2006, our focus was to deliver a good, solid service at a bare bones price. In the four and a half years since that launch however, our customers’ needs have evolved quite a bit. While investors today certainly value low commissions, they also demand a great trading service with a rich set of advanced features. So, we have been working hard to continuously improve the Zecco Trading experience. In just the last year or so we’ve introduced major improvements in our quotes and research offering as well as launched important new tools like Zecco Streamer, Zap Trade and the new Zecco Mobile iPhone app. We’ve also made substantial improvements in customer service and upgraded our core infrastructure to dramatically improve performance and reliability. With this change we are no longer offering 10 free trades per month. As before, there are no minimum balance requirements or inactivity fees to open or maintain a Zecco Trading account. At $4.95/trade, Zecco puts itself at the same level with TradeKing, another popular discount broker, in terms of commissions, but I doubt many will see them as equal because they are just not. And at $4.95, I don’t think Zecco has any advantage over other brokers. Two years ago, I wrote about Zecco Trading alternatives. Now with so many commission free ETF trades, you don’t really need Zecco in you want to buy ETFs without paying a commission. Are you using Zecco? If you are, with this latest change, may not be the last though, are you plan to keep your account with them? If you are considering moving, TradeKing may be a better choice since the commission is the same at $4.95, but the customer service and website, as well as research tools, are well superior. Plus, TradeKing will reimburse up to $150 account transfer fee if you move your brokerage account to TradeKing. Check out my TradeKing review for details about the broker. I am glad that I only have a small play account with Zecco. That’s too bad. Seems like a classic bite & switch to me. Yes, now I wonder how Zecco is going to compete with others without commission free trades. 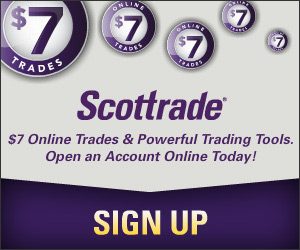 I transfered my ZECOO account last week to Scottrade. I found a referral code : KGKP0724 and I use it get 3 free trades. I really like Scottrades platform better than ZECCO. I really like the free trades… Anyway… I’m at Scottrade now. I’ve been trying zecco for awhile, it’s not great but then again it’s cheap.